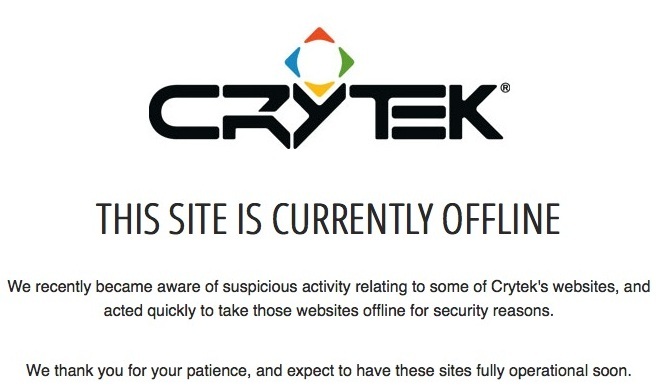 It seems that German Video Game company 'Crytek' has been the latest victim of hacking attacks on its website and few forums, and caused Crytek's family of websites to go offline. According to the company, "Our Crytek.com, Mycryengine.com, Crydev.net and MyCrysis.com sites were all subject to a security breach that may have resulted in some users' login data being compromised,". Strangely, Crysis.com has not been taken down and is still running as normal. "We recently became aware of suspicious activity relating to some of Crytek's websites and acted quickly to take those websites offline for security reasons. We thank you for your patience, and expect to have these sites fully operational soon." "Although it is uncertain whether the incident led to the copying and decryption of email addresses and passwords", it continued, "it is possible that users with accounts on these websites have had personal data copied. On Friday afternoon we started to contact all affected users via email and informed them of the potential security breach." The Company has warned users that they will be requested to reset their password the next time they log in to any of these sites.